International Islamic terrorism poses a great threat to the established world order as it is exercised by nation states in particular. It is not an American concern as some pundits point out. France was a notable victim of mass terrorism from an Islamic source in the mid 1990's. Russia has paid a terrible loss in lives due to its Chechnya involvement since 1994. In 1997, China created the Shanghai Cooperation Organization mainly in order to combat radical Islamic movements in Central Asia. China has been facing great strains due to Islamic terrorism. In December 2001, it formally asked the United States to hand over Chinese citizens held at Guantanamo Bay. The hallmark of 9/11 from its point has made the United States the undisputable victim of Islamic extremism and therefore it is more than obvious that this country would ultimately lead the way in the war on terror. The main target is to prevent terrorist groups from acquiring weapons of mass destruction, a fear that has been held by strategic analysts since the late 1980's. The roots of international Islamic terrorism can be found at first glance in the war in Afghanistan in the 1980's, a proxy war fought during the height of the Cold War. The Afghan mujahideen fought their holy war — jihad — with the help of the Wahhabi regime in Saudi Arabia and with the help of Pakistan. U.S. support was crucial during the war where the American services and most importantly the C.I.A. managed to promote the fighting capabilities of the "holy warriors" by transferring via Pakistan the necessary logistical and armament support. Over 40,000 mujahideen, gathered from Muslim states around the globe, fought in this war and some of them ultimately provided the human resources base for the terrorist organizations of the 1990's. The Afghanistan experience was of crucial significance. The defeat of the Soviets provided a great boost of self-confidence for the Islamists. In the minds of the fanatics, it was seen as a holy war, one in which the reborn Islamic movement drew inspiration from the Medieval era to overcome the will of the Soviet army. Nevertheless, their struggle would most probably have failed if it weren't for the Stinger-type missiles and other support provided by the United States. After the Soviet withdrawal in 1989, the radical Islamists became active in non-Muslim states that were populated by significant Muslim minorities. According to the historian Bernard Lewis, the radical Islamists regarded it as blasphemous for faithful Muslims to be governed by Infidels. Therefore conflicts in areas such as Eritrea, Chechnya, Bosnia, Kashmir, the Philippines and West China became battlefields full of Islamic "Holly fighters." Moreover, civil conflicts such as the one that ripped apart Algeria in the 1990's had a jihad outlook. It was the then Al Qaeda that provided the logistic, training and financing support, led by Osama bin Laden, a veteran of the Afghanistan war. In order for this international network to function, safe havens were needed for its training camps and warehouses. Saudi Arabia was not suitable since it came into opposition with bin Laden and actually forced him to leave the country. His organization was undermining the regime. Also, the fact that Western troops had been deployed in Saudi Arabia during the first Gulf War gave bin Laden the impetus to turn against his own country and more specifically to try and overturn the Saudi Dynasty. At that point, Sudan became the first state to welcome bin Laden. He was forced to leave in 1996 because of combined international pressure. It is interesting to note that Sudan was not functioning as a proper state due to its long civil war and therefore was an ideal place for a terrorist hideout. But an opportunity to return to Afghanistan presented itself during the Taliban campaign, and it was not to be missed. Bin Laden and his followers supported the Taliban in exchange for the opportunity to transfer his headquarters back to Afghanistan. The confrontation between the radical Islamists and the United States is not surprising since their principles stand in stark contrast. Moreover, the Islamists portray themselves as defenders of the faith and not of any particular state or nation. They reject the basic principles that the international community has been adhering to for the past 200 years: the rule of law and the existence of nation states. Bin Laden called on Muslims to attack every Westerner, and according to Kanan Makiya and Hassan Mneimneh, his speeches resemble ones used in the 7th century when the Arab tribes managed in just a few decades to break up the then Persian Empire and inflict great damage on the Byzantine one. During the 7th century, the Arabs managed in less than two generations to transform themselves from an amalgamation of tribes on the Arabian Peninsula into the greatest power the world had ever seen, stretching from Spain to India, and from Central Asia to Somalia. It is a paradigm that invigorates modern radicals who believe the same can be achieved nowadays. Early on Al Qaeda discovered the possibility of attacking the enemy with weapons of mass destruction (WMD). 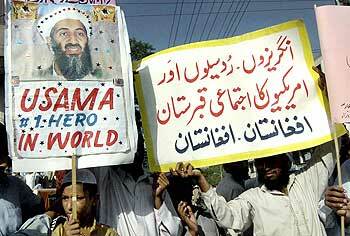 In 1998, an associate of bin Laden's was arrested in Germany where he was about to buy elements for WMD. Al Qaeda also tried to get a hold of uranium from a Southern African source, in Sudan. In parallel with the above activities, Al Qaeda proceeded with its plan to involve the United States in a major unexpected attack that fully complied with its notion of global guerrilla warfare, of proportions unknown to humanity before Sept. 11, 2001. The attack on the twin towers killed 3,000 people and cost the American economy over $90 billion. It also showed for the first time in history the capabilities that non-state actors have, and the main challenges that would have to be dealt with in the 21st century. The world's response to 9/11 was a unified condemnation of terrorism and involved swift and decisive action by the United States in dealing with the Taliban regime in Afghanistan. The United States destroyed Al Qaeda's bases and completely disrupted its operational capabilities. Since then, no other attack has been staged on U.S. soil. But the problem of Islamist terrorism remains, as witnessed during the past five years by successful attacks in Madrid, London, Bali, Cairo, Amman, Jeddah, Karachi and Istanbul, as well as by countless attempts to strike elsewhere. Intelligence and security agencies have broken up scores of terrorist cells that were on many occasions interrelated with organized crime, making the hunt for terrorists an incredibly complicated procedure that requires, among other things, international cooperation and intelligence exchange. Furthermore, underdevelopment in the Muslim world must be addressed in order to prevent the radicalization of existing regimes that confront international pressure on the one hand and populist demands on the other. The resolution of the Palestinian issue is regarded by many as the main element that divides the West from the Muslim world. In the summer of 2000, the then prime minister of Israel was ready to accept a Palestinian state and to provide it with some 95 percent of the West Bank's total surface, with East Jerusalem as its capital and with strategic control of the Jordan Valley. These were the maximum offers ever made by the Israelis but they were rejected by the Palestinian leadership and Yasir Arafat, a complication that lead to the beginning of the second intifada in September 2000. The result was the political failure of the Barak government and the subsequent arrival of the hawkish Sharon administration, which lead to the continuation of the cycle of violence still raging in Israel. It is fair to say that it is in the interests of radical Muslims not to find a solution to the Palestinian problem in order to perpetuate hatred and mistrust toward the West for years to come. Overall, the world faces the difficult prospect of seeking safety without compromising freedom and prosperity, which were upheld even during the most difficult times of the Cold War. The first crucial step toward the long-term strategic counterbalance of the radicals should be decreasing the West's energy dependence on Muslim states, a signaling move that would most certainly unleash progressive political forces in those states in the coming decades. The current energy-rich Middle East has been able to create an artificial social context wherein medieval norms thrive on a par with superb business and technological advancements, a combination that has proved very lethal indeed.